The Rainin EDP3 Plus Digital Pipette offers a high degree of control and comfortable use in a precise digital format. These single channel pipettes perform basic functions such as pipetting with a mix function, sequenced dispensing, programmable fixed-point dispensing, and a cycle count to keep track of pipettings. 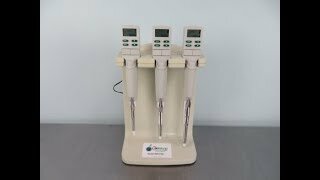 Users of these electronic pipette can also easily navigate to a second more advanced settings menu through the the digital control panel with easy to read display. The EDP3 Plus also allows users to set intervals for an auto paced dispense and select their desired speed from 10 levels to customize their use to their comfort level as well as dilute, titrate, manual pipetting and GLP user logging. This digital pipette is powered with a Li-ion battery, and comes with a rapid charging station, with a sequential charge feature, charging pipettes in the order of placement. To conserve battery this single channel pipette will go into sleep mode after 10 minutes of inactivity, so you can pick up where you left off. Please note pipettes use LTS tips. This Rainin EDP3-Plus Pipette LOT has been fully inspected and is operating without issue. Please note, pipettes use LTS Tips All of our lab equipment comes backed with our standard warranty. Should you have any questions, please don't hesitate to contact us.